Typical Aries are pioneers who motivate others with their exemplary enthusiasm. Aries often throw caution to the wind and go straight to the point, which they may later regret. Aries live for today – tomorrow is too far for them, yesterday has gone, so the only moment for life is right now. People born under the sign of Aries are initiative and ambitious. They become easily enthusiastic about something. Aries often lack certain gentleness, humility and sense of social tact. In addition, they are usually impatient, which is the worst combination for their diplomatic skills. The element of Aries is fire. They are full of energy, courageous and enterprising. Aries are not naturally thrifty. What brings joy to them is not money in the bank, but money transformed into experiences and people's smiles. Aries are unable to do anything by halves, they fall in love with their full hearth. Aries can hardly pretend passion they truly do not feel. These people are vital and always look for new challenges and adventures. People born under the sign of Aries are forceful and ambitious. They easily become enthusiastic about something new. A typical Aries is a pioneer who encourages others by own eagerness. They are often idealists who defend their thoughts aloud. The passion of Aries can take many forms, from a joyful coffeehouse debate to a blind dedication of the Knights Crusade. If we want understand the true nature of Aries, it will be helpful to look at the properties of its element – the fire. Fire emits heat and light what can be actually seen as its obvious description. But besides that, its most important feature is that it always needs something to burn. Fire can not exist alone. It is constantly changing the form. It shots, flares, and again it burns weakly. But flames can not be stopped easily. Aries people, whose personality is highlighted by fire, are the same as this element – they constantly need something to focus on and goals to which their desire can be directed. There always must be an objective, a prospect for the future and the challenge that need to be overcomed – that is what encourages Aries. They consume a lot of energy, which is nevertheless a kind of a flare-up, a series of strong but brief flashes. This represents the intense energy that moves Aries personality forward when the objective is sufficiently motivating, but also the lack of perseverance and stability in cases where obviously nothing is in the game. The difficulties come when the world seems to be too clearly defined to Aries. Fixed daily schedules, routine, tradition and the future that can be easily expected, they all can give the feeling of the “lack of fresh air” to Aries. In such case people born under the Aries zodiac sign can sit by the window and morosely meditate that even after twenty years they will sit and muse by the same window again. Aries needs to feel that the world still offers thousands of undiscovered opportunities and that the next adventure is waiting behind the corner. Such person lives in the future, because it is his or her version of the reality. Aries always act according to the principle: the shortest connection between two points is a straight line. Detours, pedantry or very detailed work does not suit well to the personality description of this sign. His or her strongest motives lie in the desire to move forward in any way. Therefore, a requirement to stand still and think about him/herself makes a hard test. When Aries carry out such self-reflection, it often turns out that there is only a little real confidence in his/her self-assertion. They have to develop the self-confidence in the long process, through collecting large amounts of experiences. Because Aries is a fire sign, it has also to do with intensity, movement and passionate progress. Aries can not walk submissively, diplomatically and with regard to the welfare of others in the first place. Where he or she appears, they will also usually leave a significant trail, which can be perceived at least by those who will come next to them. Therefore, you can count the “unforgettableness” to the general Aries description as well. 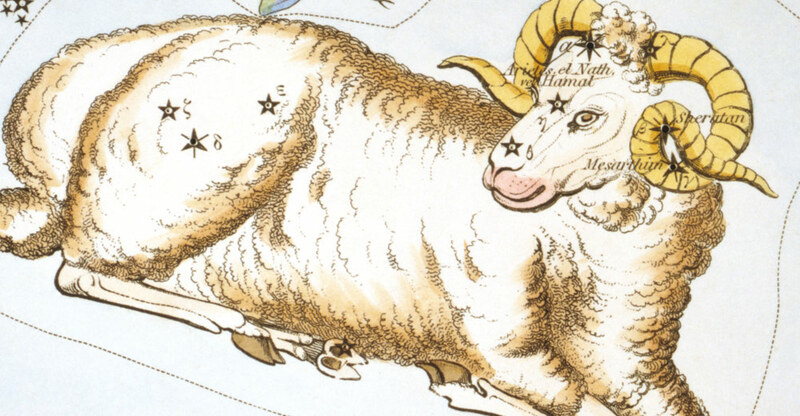 The fighting spirit of ancestors is rooted deep inside the personality of Aries. The life without contest and competition, where they can win or loose, is a senseless existence. In doing so, however, they regards a fair game. Aries is not an illegal warrior who will attack from the ambush. Straightness and the open-hand combat without tricks and traps, where everyone has the equal chance, this is the basic idea of this zodiac sign. The better simply wins. If you would gather all the zodiac signs in the same room where a table covered with gift would be, and everybody could take something from that pile, be sure that Aries would be the first at this table. The commitment to action and the direct approach forces internally him or her to be everywhere earlier and faster than others. The Aries man lives by the principle of activity. Everything he does seems to be meaningful and important in his eyes. The Aries man tends to be permanently “in action” and wants to keep something to deal with all the time. He wants to be gaining ground and affirming his masculinity. The Aries man has the ability to fascinate and motivate others, but he lacks the steady background a bit. He expects that he will always win due to his strength and positive focus. If you are looking for safety and comfort, Aries will probably not be the right friend. They have sharp hooves and hard horns. They are bursting with ideas and creative energy. A typical Aries sprints forward and you have to be careful to keep the pace with him. Because men born under this sign do not look back very frequently. Just imagine the disappointment: he would run on the beach, waiting you to catch and hug him, and after a sudden turn he would see only his own footprints in the sand behind. Confidence and determination are evident among his personality traits. Aries is not capable of doing anything halfway and usually he plunges headlong in love. But beware, when he falls in love too fast, it is like he would get on a moving train – in the case of disappointment he will briskly jump out without embarrassment. However, If he will not lose interest in you, Aries can be completely loyal and devoted to you. Besides, why should he flirt when he gave the whole heart to you. However you must strive to be a real fairytale princess for him. Aries will hardly pretend a passion he really do not feel. That is the important trait of his personality. When, from time to time, he will see fresh flowers instead of shopping bags in your hands, he will certainly be pleased that he chose the right one. Yet he is the one who should take care of you! Leave some heavy or difficult shopping to him and look forward to what sweet words will grow on his lips when he sees that you are the beautiful woman in the first place, and not only a practical housewife. Pay attention to him, because this way you can keep a relationship that will last long. The Aries woman is intuitive. She can read the body signals and energies that are moving close to her. Thanks to this the Aries woman can spontaneously go on a journey into the wide world without worrying about the consequences. She is free, open minded and happy to make new contacts. The Aries woman also recognize well when the time comes to make a stop on a journey. Than, it is always necessary to restrict all activities and calm down a bit. Aries woman are lively, daring and they are always looking for new challenges and adventures. Sometimes they are stubborn and usually not very keen to compromise. If you would like a friend who will be obedient and easygoing, you should rather look for a different zodiac sign. Rebelliousness and wildness are apparent among her personality traits. Better than thinking that this woman will adapt to you is expecting that it will be you who will understand and fulfil her requirements. Aries women are in fact one of the few that can quite smoothly get along without a man. Anything he can do, she can handle too (at least that is what Aries woman are often thinking). However, do not be fooled, even if she is a vigorous and energetic being, she needs the romance, tenderness and caress just like any other woman. Expect, nevertheless, that women born under this sign are active and enterprising. They will feel free to ask you for a date, if they will find out that you are a bit hesitant. Monotony and peace can be depressing for them. Unfortunately, certain aversion to stereotype is a very significant trait of their personality. If something is boring or too lengthy, they lose interest in it. And please, do not tell them what they should do. These women want to decide freely and not to feel being controlled. Therefore give plenty of freedom to the Aries woman and show her that her perseverance can not unsettle you in the least.